With 100 watts of power and a custom 12 in. speaker, the Katana KTN-100 delivers a commanding range of gig-worthy tones that gracefully slice through any band scenario. The amp also excels for home playing, with a uniquely efficient design and innovative Power Control that provides inspiring sound and response at low volumes. 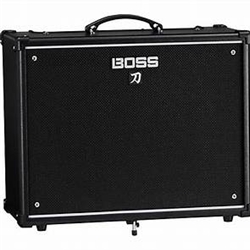 In addition, the Katana KTN-100 includes integrated access to 55 BOSS effects, which are customizable using the free BOSS Tone Studio editor software. Up to 15 different effects can be configured in the amp at one time, enabling you to bring fully prepared tones to the stage in one amp. Designed for guitarists who are serious about their sound, the Katana KTN-100 offers exceptional tone and touch response for stage playing, recording, and simply practicing at home. The custom 12-in. speaker is driven by a special method developed for the flagship Waza amp that optimizes the speaker and cabinet character. This gives you authoritative punch and cutting presence previously attainable only with high-end amp designs. In combination with the five selectable amp characters, the Katana KTN-100 produces class-defying power and expressiveness to meet any playing situation. Sharpened to perfection by the BOSS engineering team, the Katana KTN-100’s five amp characters offer everything from organic vintage tones to modern high-gain sounds. Clean is natural and transparent, while Crunch offers satisfying grit and response. Lead has a wide gain range to suit many styles, from fat, stinging blues solos to fluid legato shredding. With DNA inherited from the Waza amp, Brown delivers refined high-gain tone sought after by the world’s greatest rock players. The Acoustic character further enhances the Katana’s versatility, providing optimized tone that makes acoustic-electric guitars sound stunningly natural. With its built-in BOSS effects and recallable Tone Settings, the Katana KTN-100 lets you perform anywhere with just a guitar and amp. Connecting to BOSS Tone Studio via USB provides access to 55 effects that are fully customizable for your needs. Going beyond standard distortion, delay, and reverb, the selection also includes powerful tone-shapers like pitch shifting, ring mod, slicer, and more. You can load 15 different effects in the amp at one time and use up to three simultaneously. Four Tone Settings let you store custom amp and effects setups for instant recall, and you can always jump to the current panel settings at the touch of a button. It's also possible to connect optional footswitches and expression pedals for hands-free control on the gig. While the Katana KTN-100 includes many advanced features, it’s amazingly simple to operate. Dedicated knobs for multiple gain stages, three-band EQ, and presence allow you to quickly dial in your tone by ear, just as you would with a standard tube amp. Essential effects parameters are adjusted with a simple knob twist, and memories can be stored with a brief button hold. The Power Control is great for throttling back the volume for small stages and home playing, and also includes a Standby setting that mutes the sound for switching guitars or taking breaks. And by flipping out the integrated tilt stand, you can easily angle the amp back for better sound projection.